When visitors come into town, they usually want try some “famous” Chicago pizza. From what I’ve noticed, these famous Chicago pizzas usually include Pizzeria Uno, Gino’s East, and Giordano’s. As a native Chicago pizza snob, I have been trained to scoff at these brands. However, there are various reasons why these joints have garnered legendary status—some of it involves pure historical benevolence (aka, being at the right place at the right time) while some of it involves the quality of their pizza. I put aside my snobbery for a night and put on my impartial hat at Giordono’s. Pizza eaters know that if you’re ordering a deep dish or stuffed pizza to expect at least a 45-minute wait. Well, on this busy Friday night, we certainly waited the full 45 minutes (and then some) for our pizza. It would have been a much easier wait if they had remembered our appetizers, but I digress. Giordono’s has simple décor with their standard checked tablecloths and booths, but its simplicity has an air of coziness. As a former Giordano’s waitress, however, I know that they don’t hire the world’s most experienced servers—in fact, I wouldn’t be surprised if serving at Giordano’s was many of their servers’ first food service gig. The lack of quality of wait staff can be a deterrence on busy nights, but don’t let that begrudge you from trying their stuffed pizza. 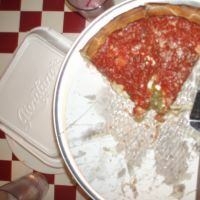 Yes, there is a reason why Giordano’s has stayed so popular for all of these years, and it is because of their appetizing, cheesy pizza. The cheese layer is thicker than the tomato layer, as is expected with stuffed pizza, and the crust is pleasant to eat with a nice crunch. The ingredients are unremarkable but usually pretty fresh. The price is pretty standard with a 12-inch stuffed pizza hovering around the $20 mark. Is it Chicago’s finest pizza? No. Is it a stuffed pizza that non-native Chicagoans should feel comfortable trying? Yes, absolutely—as long as they know that outside of this chain with over 20 accessible Chicagoland locations, there are other stuffed pizzas more worthy of trying—if they are lucky enough to be in the neighborhood to try them.